"Plain View Farm Scholarship Essays"
"Life in Norway vs. South Dakota in the 18-19th Centuries"
The journey for my great great grandparents, Alfred and Bergit, and the difficulties and differences they faced between the lifestyles of Norway and America is in the following essay I am attempting to write today. I want to try to compare life in Mandal, Norway with life in Bryant, South Dakota. Great great grandmother Bergit was born in Norway in 1885. She migrated to the United States with her sister Kathrine when she was 18 years old. The reasons for migration will be listed below. She came over in 1903 on the steam ship Hellig Olav it took approximately 2-weeks. Then she went to Bryant, South Dakota by train where her brother was living. Her future husband, Alfred, was born in the Dakota Territories on November 27, 1886. His parents were born in Norway. Most of the lower class in Norway left because of the following reasons: 1. Cotters used land of the wealthy because they didn't have their own land so whatever they grew some of the monies from the crops went to the wealthy. Servants in Norway worked for food and a place to sleep. 2. The poverty-stricken were under strict rules and regulations from the wealthy land owners so many of the cotters were upset and most ended up leaving Noway [cotters were sharecroppers on land owned by the farmer--Ed.]. 3.1n the early 1800s the upper class controlled everything and treated the lower class very poorly. 4. In the early 19th century there was a religious movement called Haugeanism. Haugeans met in their homes and were reading the Bible on their own and coming to their own conclusions. 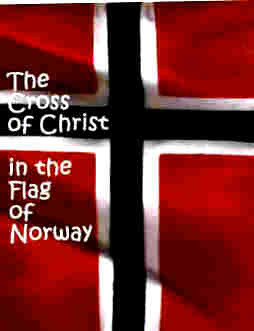 The Norwegian Lutheran Church, the State church, prohibited the Bible being read outside the church making this sect of Norwegians determined to leave for the New World. They moved because they wanted to practice their religion without interference. The population in Norway was very small. In the mid-1800s the population was a little over a million. There were 77,000 independent land owners and the rest were tenant farmers or servants. In Norway the eldest son in a family inherits the father's land when he dies, so the remainder of the sons had to start their own business or immigrate to other countries. Most families were struggling to stay alive. Potatoes reached Norway in the 18th century where they became part of the peoples' regular diet. Lefse is kind of a Norwegian version of Burritos. Potatoes were either baked, fried, boiled, or mashed. Some common crops grown in Norway were: barley, oats, and wheat. Few people starved after potatoes arrived but a blight similar to the Irish potato blight affected the potatoes and, as a result, many people began to die of starvation. The first week of July in 1825 immigration began from Norway to the US. The first sailing sloop [named the Restauration--Ed.] filled with immigrants left Stavanger, Norway for New York with 52 people on board. The trip was two months long and even a baby was born on this first trip. Those who came to the US encouraged their family and friends back in Norway to come. They sent money for their tickets and helped them when they arrived in America. The Homestead Act passed by Congress on May 20, 1862 [signed into law by President Abraham Lincoln--Ed.] allowed all settlers 160 acres to farm with only a small filing fee of eighteen dollars. Peasants in Norway were very happy with the Homestead Act. They now had free land to farm when they arrived in America [was this a move of God to bring devout Christian believers of the Haugean kind to America? At the same time, aboard the same ships sailed by Haugean believers, the social and economic-based emigration from Norway brought State churchmen too, which created difficulties and also greatly influenced the development of Lutheran schools, churches, and institutions in a ways that helped produce the now ascendant liberalism of the 21st century secularist society in America--Ed.]. The farmers in South Dakota had many more advantages than in Norway. They had 160 acres in America versus a small plot of land in Norway. The land was fertile and water was plentiful. Everyday fare on the farm consisted of what they raised and grew. Any surplus was sold to buy things they didn't raise or grow such as: sugar, coffee, cocoa, and peanut butter. Farm families were mostly self-sufficient and most of what they raised was used by them. Most American farmers did their own butchering and preserving of meat. They canned the meat or smoked the meat because the did not have refrigerators or freezers. They used what was called a cistern [which collected run-off rainwater from the house roof for drinking and household family use, since it was soft water free of minerals and salts--Ed.] where cream, milk, and butter were stored. Vegetables like potatoes, carrots, and turnips and fruits like apples and maybe pears were stored in the cool corners of the farm house basement. Life was difficult and harsh, but so much better in the United States for the immigrants than in Norway. They had to work hard, but got much in return. My great great grandparents also worked extremely hard but succeeded with their faith in God and their determination to make their family flourish. I am so thankful for their many sacrifices which has enabled me to live a better and fuller life because of them. "TWO COUNTRIES ONE STORY: GREAT GREAT GRANDMA BERGIT"
My name is Ariana Drew Pujals and I am 15 years old. My mother's name is Kristin Barry Brown Pujals. My grandmother's name is Gloria June Ginther Brown. My great grandmother's name is Pearl Andrena Stadem Ginther and my great great grandmother's name is Bergit Wilhelmine (Holbeck-in Norwegian Holbek) Stadem. Bergit was born May 22, 1885, in Mandal or Marnardalr, Norway. She was raised on a farm with her sister Kathrine and brother Andrew. Her father died at the young age of 42 and a few years later her mother died at the age of 49. When they died, her sister got a job in a nearby village and Bergit and her brother stayed on the farm a while longer. They were very poor during this time, especially after her parents died. Bergit recalled having only two pounds of rice for her and her brother to share for however long. Later that year, her brother [Andrew--Ed.] went to America and in order to get there they had to sell most everything they owned on the farm for his ticket. Then Bergit went to work for a family in a nearby town. In 1903, Bergit and Kathrine boarded a steamship in Mandal to travel to Kristiansand, Norway with monies obtained from the sale of the remaining farm implements. The old steamship was called Ryvingen. From Kristiansand they sailed to New York on the Hellig Olav. The Hellig Olav Steamship had first to third class cabins- no steerage. Scandinavian food of vety good quality was served. The same standard of courtesy and cleanliness as the first and second classes was found in the third class. This was a brand new ship. Its first voyage was March 25, 1903. The voyage for Bergit lasted about two weeks. The Hellig Olav was a two masted steamship with one funnel. It was a cargo and passenger ship. After they arrived they took a train to Bryant, South Dakota where their brother, Andrew, lived. Neither Kathrine nor Bergit spoke English. There are many reasons for their great travel to America but one of the most common reasons, which affected many people like them, was the economy. In the late 1800's the economy was stagnating. This caused emigration from Norway to America. 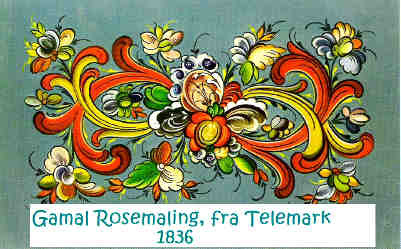 From the mid 1800's to the early 1900's almost 1 million people emigrated out of Norway to the US. Norwegians had heard about the fantastic wages and the cheap farm land available in the United States. In 1862 the US Congress passed a bill that gave new settlers up to 160 acres of free land to farm. Only Ireland had more immigrants to the US than Norway. The crops grown in southern Norway were on farms that were actually small plots of land. They grew vegetables and grains, such as, oats, barley, and rye. Potatoes were a dominant crop during this time. Bergit's farm had a few cows, pigs, and chickens. Crops were very hard to grow in Norway considering its harsh weather, and the rough terrain, and the fact that Bergit was so young, it was very difficult for a young girl to do alone. Norway has a very short growing season. Winter was considered "a time of slumbering death". One of the most common foods made by Bergit and a lot of the farmers was Lefsa. Lefsa is a potato pancake. People stated that Lefsa originated with the Vikings. When Bergit and Kathrine arrived in Bryant they both began to learn English. Bergit worked for a minister and his family. She did a lot of baking, cleaning, and caring for children. She worked for numerous families in Clark County for about five years until she met Alfred Stadem. They were married in 1908 when Bergit was 23 years old. On their farm in Bryant life was hard. They were growing crops, raising nine children and busy with activities in their church. There was never a dull or slack moment. Eventually they had a functioning farm with milk cows, and chickens. Eggs and milk were sold. They had a big garden and Bergit always was growing beautiful flowers. Life was not easy for Bergit growing up in Norway where they were poor and in Bryant where as a young married couple they built their home and started working the farm. She never gave up and she made everything possible. She had to learn to help herself and help her family. Money was always scarce so they had to do many hard jobs all by themselves. She lived through the depression and hardships of two World Wars. Times were rough. She put a happy face on things. She made do with everything she owned and always thanked God for it. That was my great great grandmother Bergit! "Jack of all Trades: Great Great Grandfather Alfred Alfred J. Stadem"
Alfred was an amazing man. A man of many talents and a family; a man loved by all. Born to a poor farming family in 1886, Alfred began his journey. All his life Alfred did not have the privileges that many of us have today. He had to make everything he needed and if he wanted something he had to work for it. He wasn't very educated but he knew so much. Alfred was self taught. Every skill he had was because he learned it from something in his past or because at some point in his life he needed that skill. Alfred was also a very faith filled man. God was the cornerstone of his life and was paramount to all other aspects of Alfred's life. God was number one in Alfred's heart mind and soul. Alfred was born in a sod house cabin in Clark County, Dakota Territory on November 27, 1886, to Peter and Marie Stadem (she was Peter's first wife, a very godly woman of deep faith in the Lord, dying young and leaving three small children for Peter to raise--Ed.]. Alfred was only five when his mother passed away. He was raised by the woman Peter remarried [a well-thought of, respectable Christian mother and widow, Mrs. Gurina Erickson who had children by her first marriage--Ed.]. In his early years Alfred attended school however he only finished 3rd grade because of the four miles to walk to school and the short terms of school sessions. Many of the family's farms were many miles apart, hence the reason why he couldn't go to school; some were up to one hundred miles away. As a little boy Alfred had to do many chores on the farms including picking up cow chips, twisting hay, thrashing grain, stacking straw, and measuring grain. In his teenage years, Alfred held a few jobs that were precursors to his adult careers. These jobs include: farm laborer, railroad worker, cementation worker and butcher. Alfred knew how to do many things which helped him in his future. In his young adulthood Alfred never went to high school or college yet he managed to learn so much. Alfred and Bergit met and married in 1908 and proceeded to buy their own farm in Bryant, South Dakota. It was made up of eighty acres of prairie grass. They planted many trees and shrubbery [some of which, particularly the lilacs, are flourishing to this day, which would have greatly pleased Alfred to see, for he was a great lover of nature and its beauty--Ed.]. Through the years their farm grew into a versatile one. The crops and livestock consisted of milk cows, pigs, farm horses, chickens, sheep, corn, flax, wheat, oats, barley, alfalfa, and millet. There were some years where the family had to fight to survive. Alfred had nine children most of which were born on the farm. All seven girls and two boys worked on the farm. Alfred prided with having all nine children graduate from high school [an evangelical Christian academy in Canton, SD, or parochial school, by the name of Augustana Normal School, also called college, since it had two departments, established by Norwegian Lutheran immigrants such as himself--Ed.] and some moved on to college [or the Lutheran Bible Institute and Bob Jones University and New Tribes Mission schools--Ed.]. Religion was the central piece of the family. Saturday night was the only bath of the week and Sunday was church. God held the family together through tough times and good times. Alfred was the type of father that wherever his kids went he probably volunteered or worked there. He was an auctioneer, well digger, thrasher/ rigger, band leader, school board member, Watertown hospital board member, superintendent, speaker at the lutheran fellowship league (started this organization [with other Fellowship members such as Stadem friends, the Stimes of Sinai, SD, and Arthur Henrikson, the family's attorney at Watertown for the Stadems, who shared the same vision--Ed. ]), vet, carpenter, builder, and shoemaker. He was very bright and hands-on. Once he made a virtual air conditioning unit by hanging cold, wet rags on the windows of the giant bus like wagon he also made. When the wind blew the rags waved and a nice refreshing cool breeze was enjoyed by the eleven people in the bus. After he retired from the farm, he and Bergit did mission work in Mexico and helped the migrants in South Dakota [raising support for a Lutheran mission church pastor there. Moreover, Alfred and Bergit were described by Mrs. Hobart of the Hobart School for the Blind in Laredo, Texas, writing to the editor here, as "strenuous workers in the Latin American Lutheran Mission," which under Myrtle Nordin Huerta (the LALM missionary) a number of Mexican mission churches and even a Seminary and had a school for the blind affiliated with it. The Claire Hobarts ran the school for the blind in Laredo, Texas, just over the border, and bussed the blind students from Mexican homes to the school and back; the Hobarts were lifelong close friends of Bergit and Alfred and fellow LALM workers and supporters. This work was supported after them by their youngest daughter, Ruth Stadem Harrington and was given a bequest in her will.--Ed]. He gave both time and money to spread the word of God (in support of the LALM and the Lutheran Fellowship League of churches and mission-minded Christians--Ed.]. They hauled a tiny trailer behind them [pulled by their powerful Kaiser car--Ed.] they called "The Snuggery". He had books, a typewriter, a bed and a wooden stove in it. I am mainly Cuban but I have already learned much of my heritage from that side of my family. Learning about Alfred Stadem has helped me understand the other side of my family's heritage. Alfred has inspired me to do what I love, to learn as much as I can and to use it. He knew so much and gave so much of his knowledge to others through example. Alfred was a true jack of all trades. 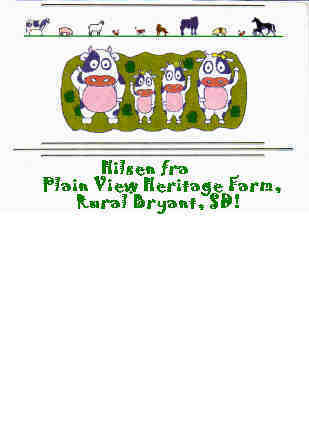 Hilsen fra Plain View Heritage Farm, Rural Bryant, SD! 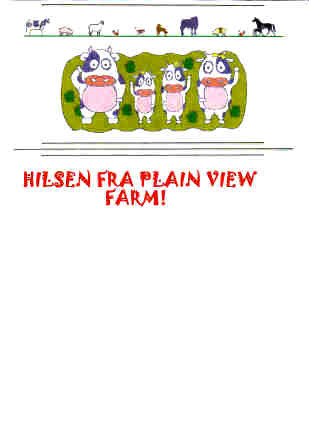 Hilsen fra Plain View Farm!